Suisun Marsh, one of the largest contiguous estuarine wetlands in North America, serves as a resting and feeding ground for millions of waterfowl migrating on the Pacific Flyway, and provides essential habitat for numerous birds, mammals and fish, including threatened and endangered species. The Suisun Marsh wetlands are listed on the Clean Water Act 303(d) list as being impaired by low dissolved oxygen/organic enrichment, mercury, nutrients, and salinity. Water quality in the marsh is mainly influenced by the flows from the Sacramento-San Joaquin Delta, tidal action, runoff from local watersheds, and effluent from the Fairfield-Suisun Wastewater Treatment Plant, which receives advanced secondary treatment. 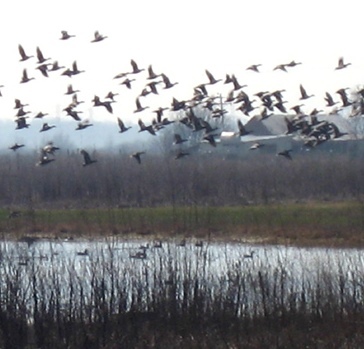 The main water quality problems, in the northwest portion of the marsh, have been linked to seasonal operations of ponds and wetlands managed for waterfowl hunting. Suisun Marsh comprises approximately 116,000 acres, of which about 52,000 acres of diked baylands are operated as duck clubs. Vegetation manipulation, in conjunction with flooding of these areas for hunting in the fall, periodically results in discharges of anoxic black water from the diked marshes. The discharges, laden with decaying plant matter, can cause severe dissolved oxygen depletion in the adjoining channels and sloughs, which sometimes leads to fish kills. The prolonged periods of flooding and drying, together with a buildup of organic carbon in the soils, can also accelerate mercury transformations and enhance methylmercury production. The goal of this TMDL is to address low dissolved oxygen/organic enrichment and mercury problems, and evaluate the degree to which nutrients may contribute to dissolved oxygen deficit. The State Water Resources Control Board adopted State Board Resolution 2018-0040 approving the TMDL at its August 21, 2018 meeting. On April 11, 2018 the Water Board adopted the Basin Plan amendment to establish site-specific objectives and a TMDL for dissolved oxygen in Suisun Marsh and added Suisun Marsh to the waterbodies addressed by the San Francisco Bay mercury TMDL. Notice of public workshop and CEQA scoping meeting at Rush Ranch Nature Center (May 12, 2017).